Kings Cross. On Monday morning, wide awake at 5am due to a mix of jet lag and adrenaline, Sanoop and I catch a 6am train from Richmond into Kings Cross. I am glad he is with me as we walk up towards the big shiny office towering behind the station, and I feel butterflies basking around in my stomach as we push through the revolving doors with that iconic logo on it. I feel so excited, nervous and proud, and allow myself to dwell on those emotions for a bit before taking a deep breath and queuing up for my new hire orientation, Sanoop taking a seat in one of the comfy lobby sofas to watch me and send me encouraging smiles and nods until I disappear into a room with all of the other Nooglers. Love. I adored London. Its energy, its history, its charm, its possibilities, its grandeur, its fun, how it matured me and saw me grow from a young insecure graduate to an adult at-times-confident professional. The way in which, over the course of five intense years, it became ‘my city,’ home to some strong, dear friendships and memories. And I missed it in Singapore. First impressions. Cold (I love that; Sanoop less so, but he doesn’t complain – he checks the weather daily, dresses accordingly, and gets on with it), grey (as my friend so beautifully put it, nothing is ever black or white in London; this first week, it’s very grey – we only see the sun on Friday), busy, bustling … I’ve changed; Singapore has changed me … This is a new way of being in London: with Sanoop (as opposed to being single); with a proper home (or, the prospect of getting a proper home, as opposed to the derelict East London flats I used to share with friends and random people); with a job I know I will genuinely love and feel proud of (…). Rationale. I can take what I have learned from being away, having grown much more healthy mentally, emotionally and physically, and integrate that into a new way of being in London. With elements I loved from before and new ones, in old loved places … Respecting, and finding new loved places, moments, habits. London being London, it very handily throws away all of the above-mentioned fears. It just IS amazing; you don’t have to do anything to feel it… it just is. Finding A Home. Sanoop has taken off the first week to dedicate it to house hunting. On Monday night, we view four units together, the latter of which we immediately fall in love with. I had suggested we look at flats around Islington and Clerkenwell, maybe Camden, perhaps as far north as Primrose Hill, but then this number caught our eye on one of the estate agency websites we were flipping through in Singapore, and after spending all of this week wandering around and viewing all sorts of places and acquainting himself with different areas, Sanoop really falls for Hampstead Heath – the charm, the small independent boutiques and cafes, the wilderness of the giant Heath. I love the idea of us creating a home in a neighbourhood that’s ‘ours,’ free of my memories of East London. I always thought of Hampstead as frightfully posh and far north, but it really is surprisingly accessible. Close to nature (our kitchen and bedroom windows overlook one of the ponds full of swans at the bottom of the Heath), with a seemingly lovely community-feel in the small village, and just a 40-minute walk, a 20-minute run or a 10-minute tube ride from the office in Kings Cross. Easy! The flat itself is bright and cosy, on the second/top floor of a well-maintained Edwardian building on a quiet leafy street. It’s got two spacious bedrooms, two bathrooms, a square landing with a big window and a rectangular kitchen / lounge with a charming built-in bookcase and window seat; something I’ve always dreamed of. This is in many ways a dream come true, and I am pleased and relieved we will be able to move into our sanctuary before Christmas (on the 15th), in time for us to nest a little bit and feel at home there before going to Denmark for Christmas – after which Sanoop will be going to Singapore to apply for a UK visa (for that, you have to be out of the country) and for work. Actually, in my Leaving London post on this blog, 2.5 years ago, I mention a walk to Hampstead Heath as one of the goodbye activities … how funny is that. And there are photos from the trip at the bottom of the post, taken remarkably close to our building. It’s all circles, circles that keep expanding, growing stronger and richer. As Virginia Wolf said, ‘Life is not a series of gig lamps symmetrically arranged … life is a luminous halo, a semi-transparent envelope, surrounding you from the moment of consciousness to the end.’ Haha. Sanoop spend quite a bit of the week in the area, and on Saturday morning, he takes me through some of all of the quaint little mews and winding, hilly roads in the village, our potential new ‘local’ hangout, Biggie Best, and some of the cosy pubs. We stop at the community centre to check out its events – yoga, weekly life drawing, readings … And we check out the various little antique and farmers’ markets. Smile at the man who’s set up a coffee shop in an old phone booth. Breathe in the sweet, warm air oozing out from the many little bakeries and delis. There’s a Daunt Books, some intriguing-looking eateries and a Euphorium Bakery right across from our street, and Keats house is just around the corner! I’m excited for us to get really familiar with it all, create memories here, experience spring, summer, autumn and another winter coming here! Noogler Orientation. Tuesday-Thusday I’m in Dublin (for the first time ever! ), which my Irish colleagues describe to me as ‘the Singapore of Europe’ – lush and green because it rains so much, and in-between all of the old historic buildings there are giant glass and steel constructions because all of the European headquarters for big tech firms are here … including mine. Arriving late on Tuesday and departing early on Thursday, I only get to see 30 minutes’ worth of the city on Wednesday, as I walk from my hotel to the office in the morning and back along the same route late at night. A wonderful day – meeting friendly new-starters from the entire region and being introduced to the company by motivational speakers who present a wealth of exciting highlights to make us feel thrilled, inspired, proud and overwhelmed. Activities. Thursday, after work, I walk Sanoop to a meditation session at beautiful Fitzroy Square, after which I meander around Fitzroy and Soho on my own, my first venture into central London this time around. Christmas lights and Christmas trees everywhere, withered leaves crunching underfoot, stately old buildings, modern new buildings, all of the buzz and spirited people at pubs and restaurants. Chatting to a friend on the phone; she’s in Denmark, and it’s evening for her as well as for me – the bliss of being in (almost) the same time zone as my loved ones. Meet the friend with whom we’re staying for dinner at cosy Soho House in Dean Street. Open fire, wine, vegan salads. Sanoop joins us halfway through, and afterwards we walk through Covent Garden and Chinatown and Somerset House, watching the ice-skaters, and across Waterloo Bridge, admiring the iconic skyline views to both sides, and catch the train back home to Richmond. On Friday morning, my friend and I get up at 6am to go running with her #WMNRUN crew of lovely girls at our age – drop our bags at Origin Coffee Roasters on the south bank and jog along the river in cold, clear, crisp weather, which makes me feel like I’m about to burst with happiness … yes, my joints are aching slightly and take a bit longer to warm up than in the steam bath-like running conditions of Singapore, but there’s nothing quite as energising as the feeling of icy air in your lungs … and these views … and running in tune with a bunch if lovely speedy people … and the post-run coffee at Origin Coffee Roasters. After work that day, we just meet in Richmond for a quiet evening. And after Hampstead on Saturday morning, we head east to meet a friend for tea at Shoreditch House, then north to meet an American-German couple for drinks in Kings Cross, and finally south – for dinner somewhere in Borough Market with a childhood friend of Sanoop’s from New Jersey, who has moved here with his lovely English wife and their two super well-behaved little kids. She’s a bag designer, and her brand, Ruskin, equals good quality, sleek, minimalist design and thoughtful manufacturing. I’m especially smitten by her ‘Camille clutch,’ and for the first time in a very long time, I feel like buying or wishing for a luxury item, hehe. 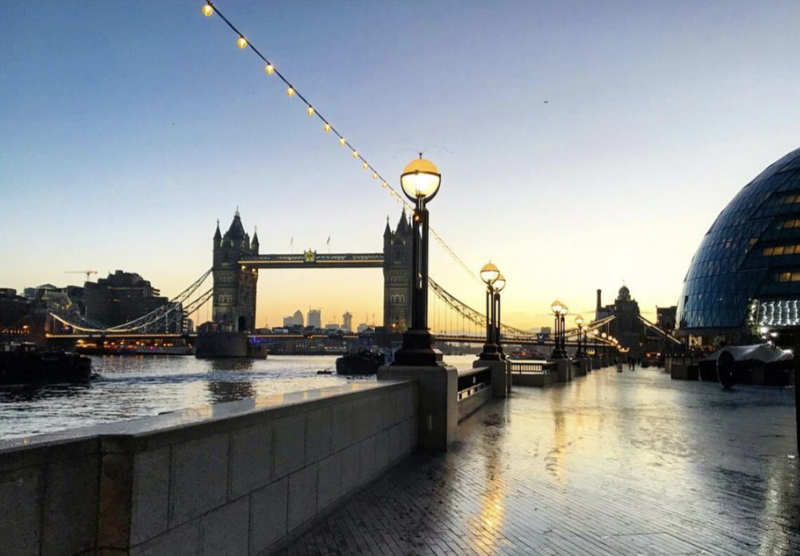 On Sunday, I go for a stunning yet bloody freezing run along the river before joining Sanoop and our friend for brunch at Caravan in Fitzrovia and a wander through Monocle’s Christmas Market. There’s a lovely Swedish Lucia choir and two sad-looking reindeer. Not really feeling like mulled wine, we end up only leaving the market with a nifty paper flower vase for our new home. We then head home to recharge before my second week as a Noogler and Sanoop’s first week of working from London (this time around) and starting conversations about the next professional steps for him. So far, we feel encouraged and excited for what lies ahead.